Browse and borrow eBooks and Audiobooks, and stream videos for adults, teens, and children. The OverDrive app is available for Android™, Chromebook™, iOS® (iPhone/iPad/iPod touch), Kindle Fire® tablets, Kobo® tablets, NOOK® tablets, Windows® 8 and up, and Windows Phone®. OverDrive is also available for Windows and Mac® laptop and desktop computer users. On your phone or tablet, install the OverDrive app from your device’s app store. 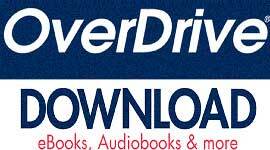 Open the app, then find and save our library’s OverDrive collection in the OverDrive app. Search for Tarpon Springs Public Library or Pinellas Public Library Cooperative. Proceed to our library’s OverDrive collection, sign in, and borrow or place a hold on a title. You’ll need a valid library card number and PIN to complete this step. Questions? Visit the OverDrive Help Site to learn more about getting started and for help troubleshooting.